Kwanzaa is a wonderful African tradition to teach your family about this holiday season, and there are many simple Kwanzaa crafts for kids that you will have fun creating as a family as you learn about this celebration. 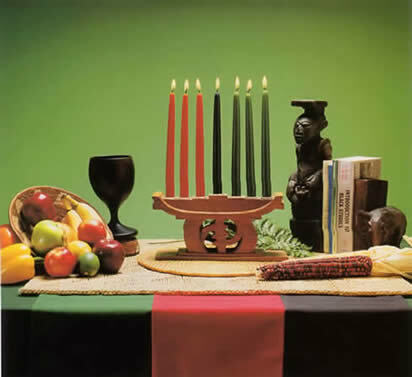 Did you know that, “Kwanzaa is a holiday that celebrates the cultural heritage of African-Americans? It focuses on aspects of the strong tribal traditions of African culture, and is celebrated with various ceremonies and activities that take place during the last week of the year. There are some great craft ideas around the internet to help introduce your family to Kwanzaa or to enhance your existing celebrations. Here are several simple crafts appropriate for young children that we thought you would enjoy. You know that I love the crafts that can be made with recycled materials or items you most likely already have in your craft closet! 1. Woven Kwanzaa Mat – This makeka is the Kwanzaa symbol of history. Colorful, simple to make and this type of weaving is a great teaching tool for children. Here are two different versions; one uses construction paper and the other foam. 2. Kwanzaa Napkin Ring Craft – Planning a Kwanzaa gathering? These would be great for the dinner table and a fun way to get kids involved! 3. Make an Egg Carton Kinara. 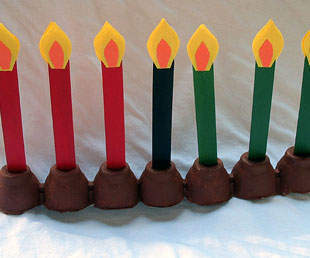 During Kwanzaa, candles are placed in a special holder called a Kinara. Read a description of the Kinara. 4. Make your own Mancala game from an egg carton and tuna cans. Mancala is a fun game, my kids and I can play for hours. 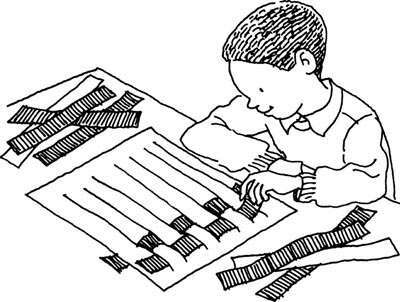 It’s simple for young kids and older kids as they learn strategy and practice math skills. 5. Kwanzaa Corn Necklace – At the Kwanzaa celebration, each ear of corn represents a child in the family. Moms or Grandmas won’t think this necklace is too “corny” to show off.